PowerHikers loved all of the excitement of the America’s Cup World Series. It was thrilling to be out with all of the fans enjoying the beautiful San Francisco bay and waterfront. We are really looking forward to the races next summer! 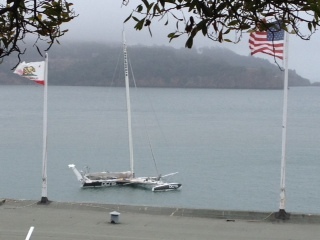 Here is a photo of our favorite non racing catamaran as seen from one of the walks in Chapter 10 of PowerHiking San Francisco. PowerHikers loved our recent walk in San Francisco. 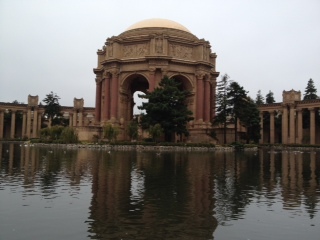 Following the Golden Gate Bridge chapter of PowerHiking San Francisco, we started at the Palace of Fine Arts in the Marina. The beautiful rotunda was built for the Pan Pacific International Exposition in 1915 which celebrated the completion of the Panama Canal and the rebuilding of the city of San Francisco following the devastation of the 1906 earthquake and fire. The beaux arts structure was designed by famous San Francisco architect Bernard Maybeck. We wandered around the lagoon and followed the path through the park. It was peaceful and serene and it was just PowerHikers and the ducks and the swans. It is now an iconic part of the San Francisco skyline but there were several times over the years where it fell into decay and there were thoughts of tearing it down. Fortunately, citizens of the City of San Francisco stepped up each time to form committees and raise and donate money to save the structure. There are historically informational signs around the lagoon that are well worth a read which explain the building’s history. We are so thrilled that it was saved and still stands for us to enjoy. You are currently browsing the Powerhiking's Blog blog archives for August, 2012.